Can Tunisia Navigate the Cross-Currents of the Muslim World? Current: Can Tunisia Navigate the Cross-Currents of the Muslim World? The “Arab Spring” erupted in Tunisia, the first Arab country to depose its radical Islamist government democratically and nonviolently. The results of Tunisia’s recent presidential and parliamentary elections indicate that dark, extremist, political Islam clearly contravenes democratic and secular values. The victory of Abdel Fattah el-Sisi in Egypt and the ouster of the Muslim Brotherhood regime enhanced the power of Tunisia’s secular opposition and was clearly the main factor in the government’s removal. Tunisia has long been considered a moderate Sunni country, enlightened and progressive, most of whose residents are literate and oppose violence. The father of the Tunisian nation, Habib Bourguiba, was the first Arab leader to recognize the state of Israel, which he did immediately after his country became independent in 1956. He was known for his sympathy toward the Jewish people. Until today, notwithstanding the revolution and the regime changes, the small Jewish community in Tunisia enjoys special treatment. After the First Lebanon War in 1982, Tunisia agreed to host the PLO’s military headquarters and extended diplomatic immunity to Yasser Arafat and his followers. In 1985 the headquarters was bombed by the Israeli air force. Tunisia played an important role in the secret talks that led to the Oslo agreements and in 1996 Tunisia and Israel established diplomatic relations and interest offices. Those relations were severed with the outbreak of the Second Intifada in October 2000. In 1956, after 75 years of French colonial rule, Tunisia attained its independence. Bourguiba set up a one-party, autocratic regime and ran the country for 31 years. In 1987, Zine El Abidine Ben Ali took power in a coup, and he ruled with an iron fist until the beginning of 2011. During his reign Tunisia flourished economically and culturally, and relations with European countries, particularly Italy and France, grew stronger. However, governmental corruption increased and human rights were trampled. Since independence in 1956, the Tunisian people have known only two rulers, Bourguiba and Ben Ali. On December 17, 2010, the first tremor occurred. In the small peripheral town of Sidi Bouzid, far from Tunis the noisy capital, a young hawker named Muhammad Buazizi set himself on fire because the authorities had denied him permission to set up a vegetable and fruit stall in the local market. His death ignited a wave of riots and protests all over the country against the regime and the economic hardships. President Ben Ali ordered that the protests be harshly suppressed. In violent riots 670 people were killed, including about one hundred who were killed in escape attempts from prisons. On November 14, 2011, President Ben Ali fled the country with his family and associates, escorted by Libyan warplanes provided by Libya’s Colonel Muammar Gaddafi. After French President Nicolas Sarkozy denied Ben Ali political asylum, he was smuggled into Saudi Arabia. In Tunisia he was tried in absentia by a military court and sentenced to 35 years in prison with a $65 million fine. The fall of President Ben Ali and his humiliating flight to Riyadh was clearly a historic event that sent shock waves through the Arab world. Tunisia’s “Jasmine Revolution” erupted in full force and spread to the other Arab countries, particularly Egypt, in what became known as the “Arab Spring.” It led in Egypt to the ouster of President Hosni Mubarak and the rise of the Muslim Brotherhood; in Libya, to Gaddafi’s fall; and in Syria to the outbreak of the civil war and the empowerment of Islamist terrorist organizations that have wrought substantial changes throughout the Middle East. For the first time in Tunisia, Arab masses dared to go out into the streets and squares to demonstrate against tyranny and corruption. Calls for freedom and equality began to be heard that were unprecedented in an Arab country. In other Arab cities, too, people demonstrated for the first time over domestic problems and not on behalf of Palestine and against the Israeli occupation. Rallies and riots erupted against corrupt leaders who had benefited for years from the poverty and ignorance of the population and looted the treasury of the country, creating police states and intensifying the cult of personality. In the 1950s and 1960s, changes and Arab regimes were only achieved via coups by colonels and megalomaniacs. Today, revolutions are carried out in the light of day by the masses, the overwhelming majority of whom are unemployed youths adept at waging their struggle with cell phones, social networks, and websites. Facebook and satellite TV have become the new weapons of these youthful throngs who have rejected totalitarian regimes. On October 23, 2011, general parliamentary elections were held in Tunisia; the Islamist party Ennahda—Renaissance—won a majority of seats. The secular parties intensely feared that Tunisia would become an Islamist country run according to sharia law, and again there were street demonstrations – this time demanding a new constitution and “new and fair” elections that would reflect the real wishes of the people. After many struggles that lasted over two years, eventually a new constitution was ratified that combines Muslim religious values with universal and democratic ones. It should be noted that since the first Tunisian republic was established in 1956, women have been granted equality, and they continue to hold positions of power. In June 2012, 88-year-old Beji Caid Essebsi returned to the political arena. A familiar figure going back to the days of Bourguiba and Ben Ali, he has served as chairman of the parliament, foreign minister, and for a short time prime minister. He established a new, secular-leftist, anti-Islamist party called Nida Tunis. In January 2014, the serving Islamist prime minister, Rashid Gannouchi, decided of his own free will to resign, along with the members of his Ennahda Party. Early parliamentary and presidential elections were announced. 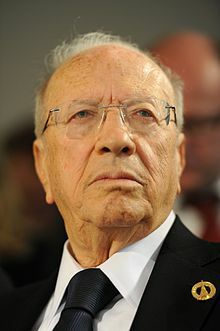 On December 14 the secular Nida Tunis won a majority of the parliament, and the elderly Beji Caid Essebsi was elected Tunisia’s new president. Will he succeed to unite the ranks and lead his country to stability and better days? Is a more democratic future in store for the country or a return to the old, corrupt practices of Ben Ali? At this point it is hard to say. Tunisia, the smallest of the Maghreb countries with a population of 11 million, mostly young and educated, has difficulty overcoming its economic and social problems. Tunisia does not have abundant natural resources, neither oil nor gas like most Arab countries, and it is not a military power. Its power is based on its strategic geographic location and its ability to compromise and prevent political frictions and conflicts with its neighbors. Tourism is an important sector, and unless large numbers of tourists start returning to Tunisia the economy will collapse and unemployment will grow. The new president will have to implement drastic measures – involving most of all the rehabilitation of the economy, with full cooperation and European, especially French, investment. President Hollande, who made an official visit to Tunis, promised to respond to the requests as well as to increase cooperation in the fight against Islamist terror. The mounting unemployment has led many young Tunisians to emigrate to France; others have joined Islamist terrorist movements such as Islamic State. Moreover, Tunisia borders Libya where chaos now prevails. There too, radical groups are trying to undermine Tunisia’s new secular government through terrorist attacks. Already before independence in 1956, Bourguiba’s emissaries enjoyed friendly relations with Israeli diplomats at the United Nations and in Paris, and in the following years they continued these relations in secrecy. In that period a productive Jewish community of 100,000 lived in Tunisia; it contributed greatly to the economy and to the cultural flowering. Earlier, for six months during the Nazi occupation of Tunisia during World War II, Jews had worn the yellow badge and were transported to labor camps, some even to extermination camps in Europe. Today, there are only about 2,000 Jews in Tunisia, most of them elderly, concentrated on the on the island of Djerba. On April 11, 2002, the local synagogue, considered one of the oldest in the world, was targeted by Al-Qaeda in an attack that killed 21 people, most of them tourists. With the attainment of independence from France, President Bourguiba adopted a moderate, courageous approach to resolving the conflict between Israel and the Arab states. In numerous talks this author held with former Tunisian Prime Minister Muhammad Mazali, it emerged that the founder of the Tunisian republic had tried several times to mediate between Arab and Israeli leaders in seeking a solution to the conflict. This was also done with the help of former French Prime Minister Pierre Mendés France, who was a Jew and a fervent activist for peace with the Palestinians. It was Mendés France who granted independence to Tunisia, and as a token of respect Bourguiba awarded him a holiday residence in Carthage where each year he would spend his summer vacation. This author met often with Mendés France and he confirmed the contacts, which, unfortunately, did not bear fruit. On March 3, 1965, at the refugee camp in Jericho, during a visit to Jordan with King Hussein and two years before Israel “occupied the territories,” Bourguiba gave a historic speech that resonated worldwide. He was the first Arab leader to call for recognizing the state of Israel. This brave step isolated him in the Arab world, and Tunisia was expelled from the Arab League by Nasser. It was also Bourguiba who agreed to provide refuge to Yasser Arafat and his fighters when, after the Israeli invasion of Lebanon in June 1982, they were expelled from Beirut in late August and the beginning of September. The PLO opened offices in Tunis, which, as noted, were bombed by the Israeli air force in 1985. Tunisia played a key role in the secret talks that led to the signing of the Oslo agreements in September 1993. Upon the transfer of PLO headquarters to Ramallah on January 22, 1996, Israel and Tunisia established official diplomatic relations and interest offices, which operated as embassies in all regards. Tunisian emigrants were allowed to come back and visit their homeland. On September 22, 2000, with the outbreak of the Second Intifada, President Ben Ali announced that he was severing the ties, and to this day they have not been renewed. Mohamed Mazli, Un Premier ministre de Bourguiba témoigne, Picollec, 2004. Le Monde, “Béji Caid Essebsi – le revenant devenu Président,” October 23, 2014. Le Monde, “Rached Ghannouchi – Ennahda a quitté le pouvoir,” October 14, 2014. Michael Laskier, Middle East Review of International Affairs, Vol. 4, No. 2 (June 2000). Freddy Eytan, La France, Israël et les Arabes, Jean Picollec, Paris, 2005. Béchir Ben Yahmed, dans Jeune Afrique/l’intelligent, n° 2048, du 11, au 17, April 2000. Discours de Jéricho, Les Temps modernes, 1967, n° 253.